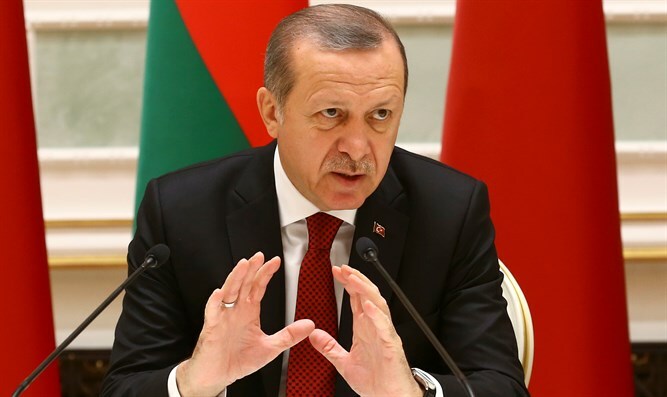 Turkish President accuses the West of backing "terror groups" operating in Syria, including ISIS jihadists. Turkish President Recep Tayyip Erdogan on Tuesday accused the West of backing "terror groups" operating in Syria, including Islamic State (ISIS) jihadists. At least 37 Turkish soldiers have died in Turkey's major incursion inside Syria since it was launched in August to back pro-Ankara Syrian fighters battling ISIS and Kurdish militia. Casualties have mounted as the military seeks to take the town of Al-Bab from ISIS jihadists and Ankara has become more impatient over the lack of support from the U.S.-led coalition against the extremists for the Turkish operation. "The coalition forces are unfortunately not keeping their promises," Erdogan said at a news conference alongside visiting Guinean President Alpha Conde, reported AFP. Turkey has met the fiercest resistance yet of the campaign in the fight for Al-Bab, located some 25 kilometers (15 miles) south of the Turkish border. Erdogan complained that rather than supporting Turkey, the West was backing the Kurdish Peoples' Protection Units (YPG) and Democratic Union Party (PYD), who work with the United States on the ground in Syria, and also ISIS. Ankara sees YPG as a terror organization linked to separatist rebels in southeast Turkey. That stance puts it at odds with the United States, which views the YPG as a key ally in its fight against ISIS. "They are supporting all the terror groups -- the YPG, PYD but also including Daesh (ISIS)," Erdogan charged on Tuesday, using the Arabic acronym for ISIS. The United States on Tuesday rejected Erdogan’s latest accusations as "ludicrous", reported Reuters. State Department spokesman Mark Toner added there was no was basis for such an accusation.